Since I started teaching for a University a few years back the course has grown and grown. This year, I was responsible for not only one but two final year courses at separate universities (as well as working full time as a pharmacist!) so my free time has been, well, pretty non-existent or filled with guilt about the fact I wasn’t doing work, well, when I wasn’t doing work. If you have been there you will know that it is not a good place to be at. Your work/life balance becomes non-existent and every waking minute becomes overrun with panic and plans for what’s going to happen next. Why am I telling you this? Well, I suppose it’s an explanation as to why I’ve not been around. And an explanation for why I haven’t done much sewing in the last 9 months. The courses started in September but, as anyone who teaches knows, it’s the preparation (and the marking which is mostly what I’ve been doing this weekend. 169 exam papers. Eurgh.) that takes up most of your time. My students sat their exams for the module last Friday, and the once almost-inevitable breakdown that was looming on my horizon has been sunk by my will to get a bit of my life back! So, after spending a lovely weekend with the Family Tweedie and some other friends, and chatting to the wonderful Tabatha about how depressing it was not sewing, I decided to join in with her April challenge. I didn’t think I’d be able to match her two hours per day rule, so I settled on just the one hour per day (or, more accurately, an average of 7 per week), as I knew there were days I wouldn’t be able to fit any in. I’m glad to say that, so far, I’ve managed it ok and it’s been great! It’s so nice to take myself away from work for a while and just do something I actually want to! So, rambling all done, here’s my breakdown of the first two weeks. Total time sewing or preparing to sew: 16.5 hours. I beat my goal: yay! I actually did about 2.5 hours after returning from the Tweedie Weekend of Fun. I printed out, taped together and cut out the pieces for two patterns – the Sense and Sensibility swing dress and the Victory patterns Ava dress. I also remembered why I really detest printing out patterns at home…If I didn’t have a ridiculous amount of money on my university print account I would’ve just ordered paper patterns and traced them! I cut out the pieces for my Amy Butler weekender bag. I don’t really have a good bag for hopping to visit someone for the weekend so I figured that, since I’ve had this pattern for many years, I should really do something with it. Afterwards, the Great British Sewing Bee, of course! Who’s your favourite to win? Obviously now that we’ve had the second week the selection is whittled down a bit but still…tell! I went to the pub. I did no sewing or sewing preparation. I talked nonsense, ate seriously tasty food and crawled into bed about midnight. It was great. Today I pinned and cut out the pieces for my Swing dress toile, using some fabric left over from one of Jen’s wedding dress incarnations. 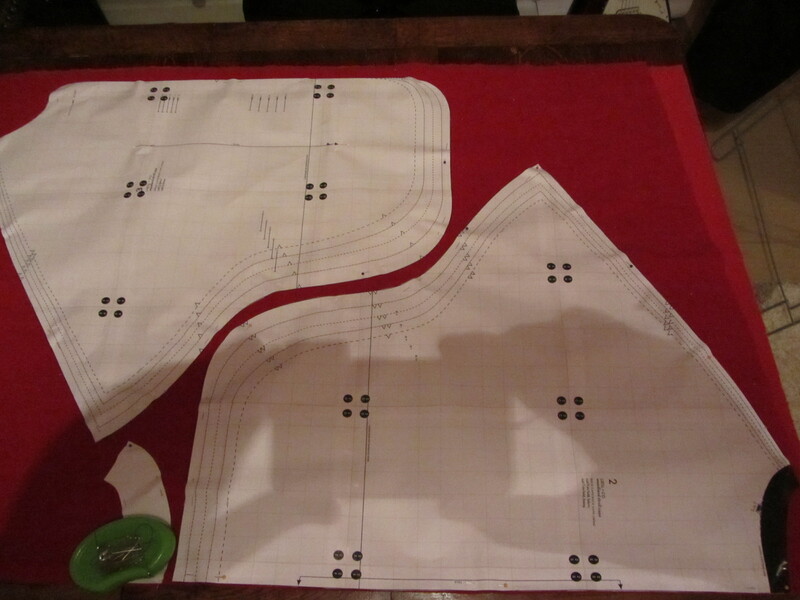 I then transferred all the markings and notches and pinned the darts ready for sewing. 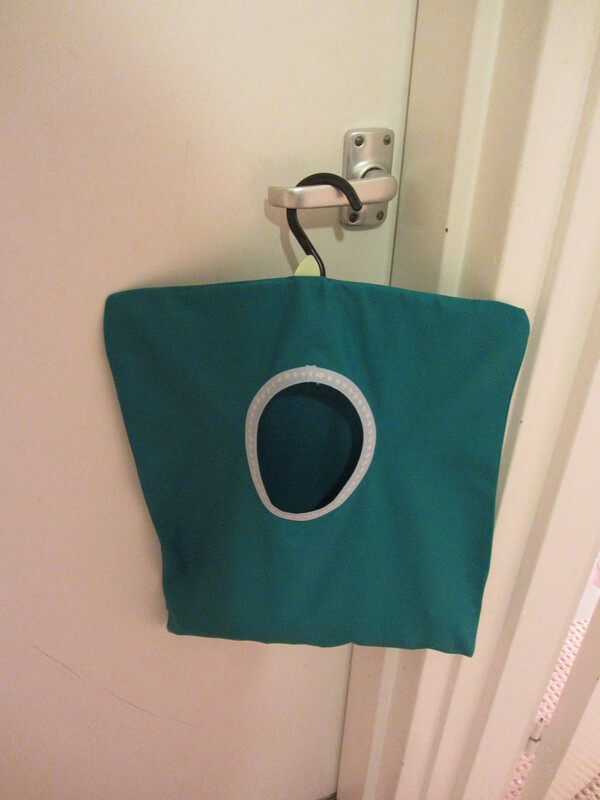 I made the two peg bags below: one for me (after only 6 years of having lived here!) and one for a friend at work who bought a house a few months ago. He specifically requested one, oddly enough. This would’ve been much quicker had I not had to make the bias binding too. It’s slightly too narrow and I wasn’t massively happy with it so I removed it later and replaced it with store bough bias. Sadly, I didn’t get a proper picture of it finished, but I used this lovely Liberty fabric for it. 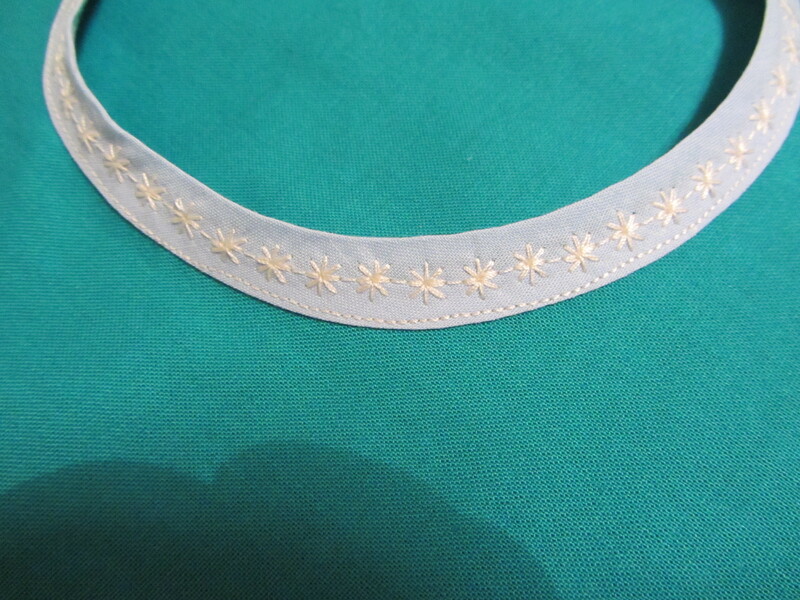 With the brown bias binding attached the whole thing looked like something that would have fit in well in the 70s. I didn’t do as much as I wanted on Saturday but I made a good start on my swing dress. After swearing repeatedly at the directions and unpicking seams I eventually got the front yoke sewn. I had to refer to Casey’s tutorial to figure it out though, and a google search revealed I wasn’t the only one shouting at the pattern. If you ever come to sew this dress I thoroughly recommend following Casey instead of the pattern instructions. 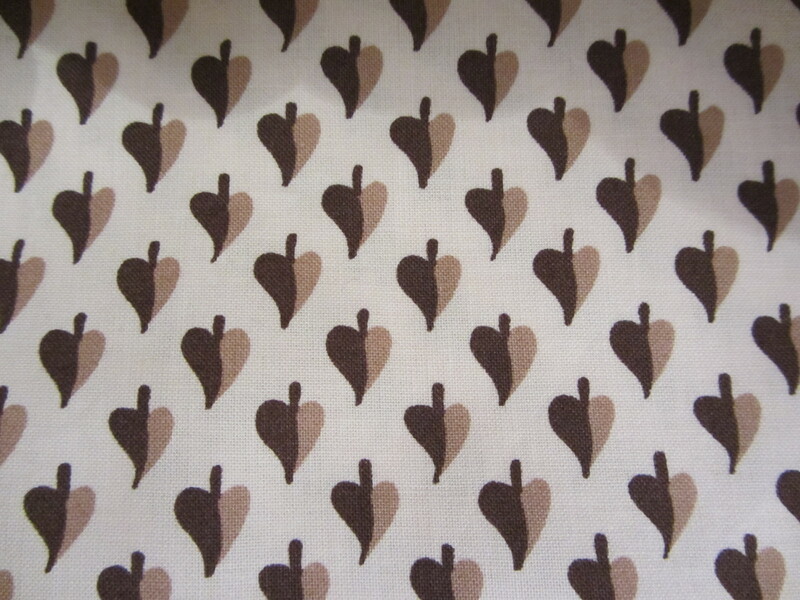 I then added the waistbands – all good – and got to sew on the skirt and the pieces just didn’t match up. I wasn’t having a very good day already, and I wasn’t about to make it worse by getting annoyed with the pattern/my sticking together of the pattern (which is the most likely explanation, let’s be honest), so I put it to one side and had a cup of tea. One of the ward sisters where I work asked me to shorten one of her uniform dresses for her. Having fit it to her and pinned where she wanted it, I realised I’d have to take 4.5 inches off the hem! I chopped off two inches around the bottom (by the way, those uniforms are really shoddily finished at the bottom, even when done with an overlocker) after going ’round it twice to make sure it was straight. I then measure 2 inches, pressed, and another two inches and sewed the hem to leave a little bit of weight there. The dress is spectacularly white so J didn’t want hem weights in there, showing through. I’m making it in a sparkly red wool that I bought in The Remnant House in Harrogate a long time ago with the intention of making another Colette Lady Grey with it. I didn’t have quite enough, though, and so directed my attentions to the cape instead. I had a retirement party to go to so managed zero sewing time. Good food was had, wine was drunk and one of the nurses described me as Batman. So there’s that. The lovely C’s birthday and a surprise Tabatha Tweedie meant no sewing today. Cocktails were drunk however. If you’re ever after a good cocktail in Warwickshire, may I recommend the Kenilworth. The cocktails were glorious, the waiter was lovely and we accidentally got the whole bar singing ‘Happy Birthday’ to C. One punter even threaten to strip for her. Instead of buying each other presents C and I decided we should just go and do something fun together for our birthdays. So we did! We had a day of adventure visiting Dunnes and eating delicious food. I also managed to cut out the pieces for my cape (red wool and grey silk lining I bought in Britex), transfer the markings and start sewing. Check out the shadow of my hands and the camera! Yet another night out! This time with some of the old doctors from the ward. If you don’t know about junior doctors, they have to rotate jobs every 4 months and so we’re always losing them. It’s sad, actually, because you don’t really get time to get to know anyone really well in that sort of time frame. This lot, though, were amazing and none of us wanted to see them go. In fact, we’d all love them to come back. Also, can you imagine how horrible it must be having to move to a new place of work every 4 months? It must be massively stressful. Anyway, I digress! I almost finished the Cape today! It’s massively straightforward to do. There was a lot of pressing involved to get the wool shaped and sitting nicely. I had some difficulty with the thickness of the wool going under the presser foot so I stopped after an hour before it got too much. I’d been invigilating exams all day too and had to start marking them so I could get them to the second marker as soon as possible. 168 exams to mark. In a week. Yikes. I’m not going to be getting much done for the next few days! I pretty much spent all day marking exams, but I did find time for the finishing touches to my cape. All I had to do today was add the buttonholes and the buttons themselves and sew up the gap in the seam where it was turned right side out. This shouldn’t have taken too long, apart from the old wool thickness issue. When it comes to doing buttonholes on wool, well, my buttonhole foot just didn’t like it. I had to unpick them all at least once and the two little prongs on the front of the foot just kept gathering up wool. I tried putting some crepe paper under the foot to see if it would improve things at all but it just didn’t. Anyway, I got there in the end, popped on some buttons and here it is! Buttons from sewbox.co.uk. This is probably he best shot I could get to show the sparkles in the fabric. It sort of makes me look like Little Red Riding Hood. I spent all day marking exam papers so got no sewing done at all. I’ll have to make it up next weekend! There we have my first two weeks! The first, obviously much more successful than the second but I’m hoping to make up that lost time in the weeks to come. And what about the Sense and Sensibility swing dress? Well, I’ve given up on it for now but I might go back to my toile in future. I’m not too upset about it: some times you just have to know when to quit! I still have plans for the Ava Pattern and the Amy Butler bag so keep watching! You are one productive lady! 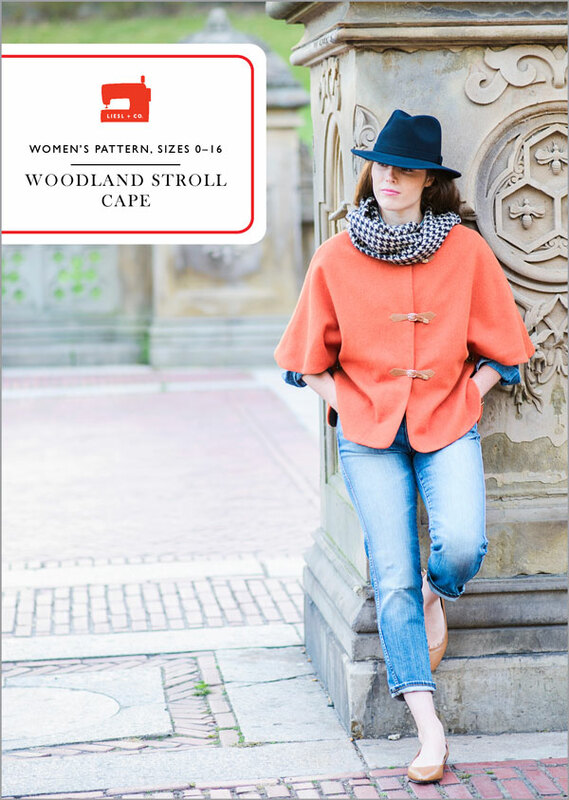 Love love love the cape! Thanks! This week has been even more productive so stay tuned. I love the cape, it’ll be so useful. I’m amazed that you’re finding time to do alterations as well as your own sewing whilst so busy with your work commitments!